Watching the Harvard Early Music Society’s performance of “Métamorphoses” felt like watching a condensed version of their rehearsals. Producer Joshua H. Billings ’07, stage director Matthew M. Spellberg ’09 and musical director Julia S. Carey ’08 presented four of Louis-Nicholas Clérambault’s 18th century cantatas, last weekend at the Agassiz Theatre. Although the performance started off shaky—both in narrative and accessibility—as the evening progressed, all its problems were resolved and the last two cantatas proved to be perfectly executed. According to the program, though the four cantatas performed were short sketches of ancient myths, they were also meant to understood as they would be to a baroque artist. While this was a bit of a stretch for the first two cantatas, the parallel between myth and modern life was seamless by the end. The first cantata, “Orphée,” told the story of Orpheus’s journey to the underworld to rescue his wife, Eurydice. Kathy D. Gerlach ’07, who sang the part of several characters including Eurydice and Pluto, captured the tragic nature of the story. By definition, cantatas feature only one or two performers who are accompanied by a small orchestra. Gerlach was the only performer singing and when she switched roles, the narrative became confusing. Adam R. Singerman ’09 as Orpheus repeated the same expressions, making his performance feel forced and over the top. The narrative was only made more confusing by the two background dancers incorporated into the scene, which seemed jarringly out of place and did not flow at all with the performance. The second cantata, “La mort d’Hercule,” was much easier to follow, largely due to the superb performance of John D. Kapusta ’09. Kapusta’s singing was full of dynamism and energy and made the story easy to understand. Though the narrative aspect of the cantata was much improved, the applicability to modern life was still hazy. Its themes of betrayal and sorrow are obviously universal, but the cantata simply lacked the feel of modernity present in the last two cantatas. In the third cantata, “Amour piqué par une abeille,” Venus and her son Love are in a garden. When Love is stung by a bee, he seeks comfort from his mother who reminds him that his own stings of love are much more painful. A lovely story in itself, the performances of Caitlin C. Vincent ’07 and Singerman added an additional comedic storyline. Vincent, the clear standout of the entire performance, played the role of a demanding woman flawlessly. From training her companion on the proper way to kiss her hand to nearly knocking the wind out of her counterpart with her umbrella, her interactions with Singerman inspired laugh after laugh in the audience. Vincent’s beautiful singing voice was matched by such expressive gestures that even without reading the translation of her words, their meaning was clear. Singerman appeared to be a completely different actor in a comedic setting, with expressions that played off Vincent’s actions perfectly. Unlike the opening cantata, the dancing in “Amour piqué par une abeille” flowed naturally with the storyline. 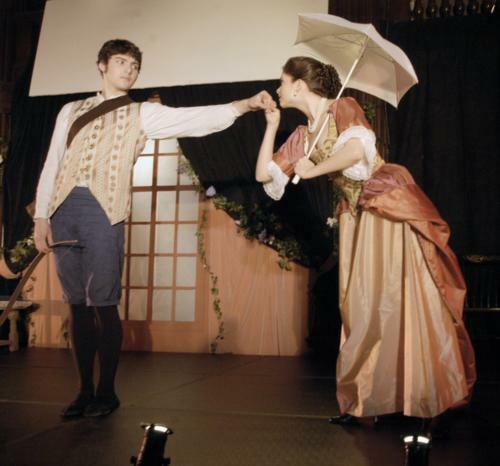 During the Nov. 16 performance, Larissa D. Koch ’08, who was also the choreographer, danced the role of the coquettish rose who Singerman spots in the garden and falls for. Singerman and Koch’s dance across the stage in courtship and flirtation was energetic and playful, adding depth to an already solid performance. In the same manner as “Amour piquè par une abeille,” the last cantata “Apollon et Doris” proved accessible to a modern audience. The story of Doris, a sea nymph who resists Apollo’s advances on the grounds that he will not be faithful, could just as easily have been about two guests arguing over their relationship at a masquerade party. The cantata proved to be a particular treat because of the duet by Amy C. Stebbins ’07 and Kurt C. Crowley ’07. The two sung in perfect harmony. Not once did one overpower the other, a difficult achievement in a duet. Another highlight of the night was the orchestra, directed by Carey. Composed of just five members, the orchestra played flawlessly throughout the night and matched each emotion with just the right rise or fall in the music. Spellberg’s vision of making the cantatas applicable to modern life seemed to depend heavily on his choice of narratives. Though his choices for the first and second cantatas were not ideal, he was spot on for the last two pieces. In those cantatas, Spellberg’s selections were matched by a flawless integration of dance, song, and music. Though the performance got off to a shaky start, narrative and performers alike found their ground as the first half of the show progressed. Overall, “Métamorphoses” proved to be accessible and entertaining, an impressive feat for such difficult subject matter.